Yes, you’ve seen this charming little Jack Russell on the Front Page before. You’ll almost certainly see him here again. We’ve been charmed by this cheerful little guy for about four years, when he was first introduced to us as a pup. His name is Kinoko, which we’re told is Japanese for ‘mushroom’. But kinoko are also a type of yōkai, which in Japanese folklore are the personification of supernatural or unaccountable phenomena that sometimes appear to people. Kinoko generally appear in the form of mischievous young children at play. As a pup, Kinoko wasn’t much bigger than a mushroom. As we see him now, he always seems to be chuckling or smiling impishly, like a playful child. I don’t know for certain that there’s anything supernatural about him, but I can’t entirely dismiss the idea. I mean, look at him. 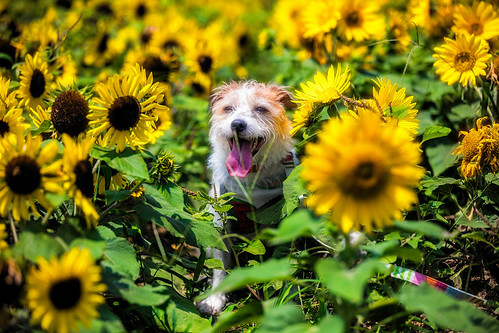 Could an ordinary dog outshine a field of sunflowers?